Enter to Win the 12 Day Belly Reboot from GoodBelly! *Disclosure: I did receive product to facilitate my review. These opinions are my own and were in no way influenced by another person. I have been drinking GoodBelly for about 6 months now, so I was really excited when the folks at GoodBelly reached out to see if I might be interested in sharing this awesome giveaway with you! I have definitely noticed a change for the better in my health since I started drinking GoodBelly each morning! I also happen to love the taste, so it’s a great way to start the day! 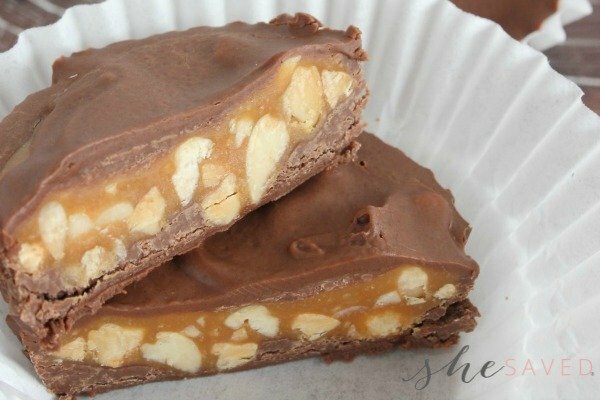 The folks at GoodBelly are celebrating World Digestive Health Day with a month-long GoodBelly Giveaway! Entering is simple! Just go over here to the GoodBelly site and sign up for their 12 Day Belly Reboot and you’ll be entered for your chance to win a prize package including FREE GoodBellyproducts, Poo Pourri, an Auvio Speaker, Method products, and much more! That’s over $120 in goodies to make your potty pretty and you belly happy! GoodBelly has just launched its first Probiotic Supplement. I am a huge fan of probiotics and I recently started taking these, so I will be sure to let you know what I think! You can purchase them on Amazon, where they get great reviews! So what is the Belly Reboot? It’s as easy as one 8 oz. 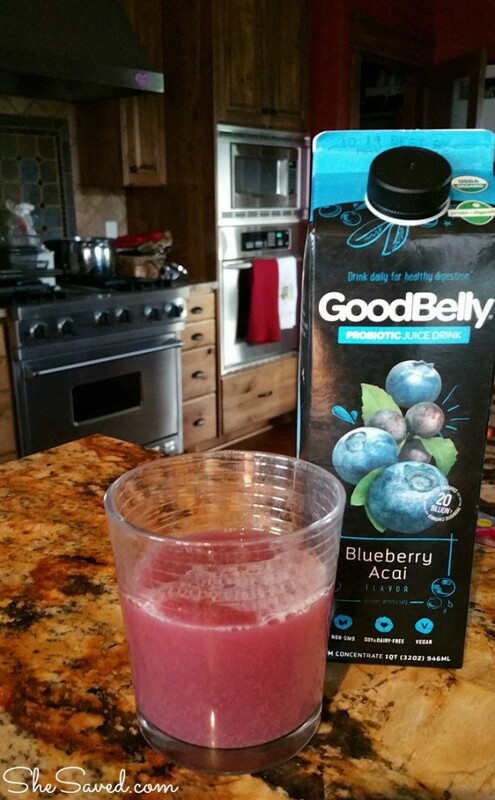 glass of delicious GoodBelly, one GoodBelly shot or one Probiotic capsule every day for 12 consecutive days. (Studies have shown that it can take about 12 days for probiotics to start doing their job in your digestive system.) Drink one alone or combine with your favorite fruity ingredients for a smoothie with a nutrition PUNCH! My favorite flavor? I love the Blueberry Acai. 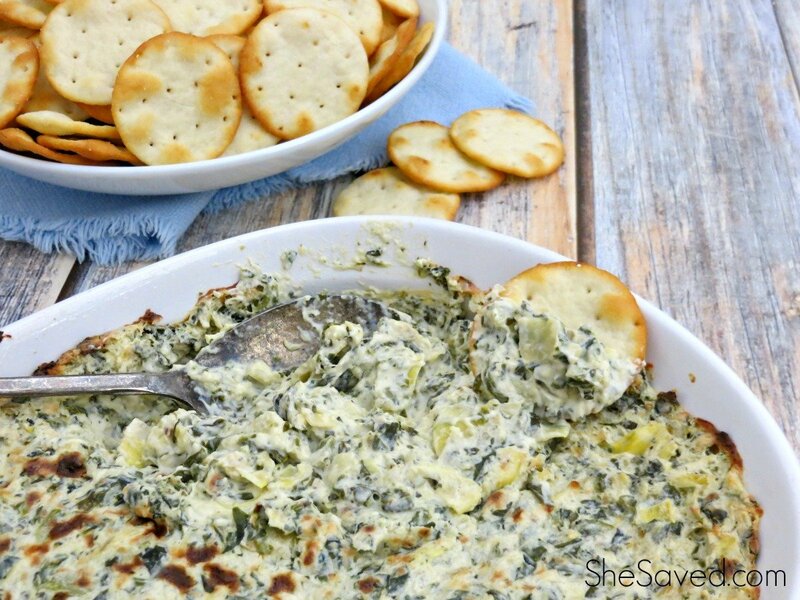 It’s so yummy and it goes so good with breakfast! Sometimes I will drink it on ice, but usually I just pour myself a glass and drink it with my fruit. In case you’re unfamiliar, GoodBelly drinks are certified organic, non-GMO, dairy-free, soy-free and vegan and are available in a variety of size and flavors to suit any taste and health & dietary needs. Made with the most well-researched probiotic strains,LP299V, each serving of GoodBelly works to support a healthy digestive system by replenishing the gut with a balance of microflora. 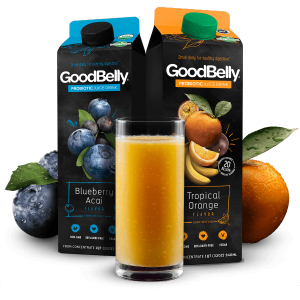 In flavors like Mango, Pomegranate Blackberry, Blueberry Acai, Strawberry and more, GoodBelly drinks are the perfect addition to smoothies and breakfast bowls, or delicious on their own.